Next time you look at a blade of grass, think about this: without green plants none of us would survive. Oil pump. The energy beneath the semi-arid surface is evidence of an environment that was once rich with life. Photo courtesy Los Padres Forest Watch. In some cases, we eat plants directly to get the energy that is stored in them. In other cases, cows or pigs eat the plants, store the energy in their own tissue, and we get energy from them. In the end, all the fuel we burn to satisfy our bodies’ energy needs come from green plants. And where do green plants get the energy to produce food? The short answer is from the Sun. Sunshine brings energy to our planet at the rate of 178 million billion watts. About 0.06% of that energy falls on green plants, driving the process of photosynthesis, which converts the radiant energy of the Sun to the chemical energy stored in sugar molecules. In addition to fuel for our bodies, we also need fuel for heat, light, and transportation. What have people throughout history burned for fuel? Anything they could find! Before 1750 the prevalent fuel was wood. Where wood was hard to find or too precious as a building material, people burned the stubble left after harvest, bricks of dried peat, or even dried dung. All of these fuel choices come from materials that were once alive. When living material dies, its energy is usually released through slow decay or passed along through the food chain to other living things. Occasionally, geological processes intervene. Silt may cover a swamp, trapping the energy of plants and animals beneath the ground. As the Earth’s surface shifts and buckles, pressure builds up on the organic material trapped in the crust. After a few hundred million years these once-living materials turn into coal, oil, or natural gas—the fossil fuels. 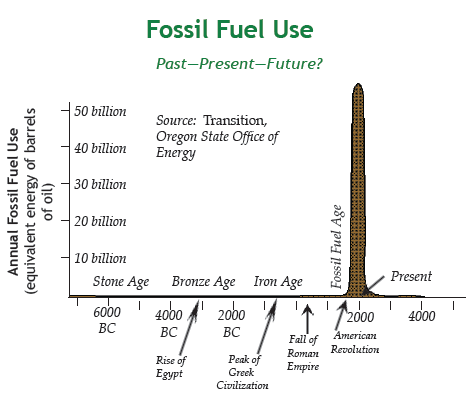 The fossil fuel age began in the second half of the 19th century, and continues to this day. I. What Are Fossil Fuels? There is no single explanation of how fossil fuels form. In general, the remains of plants and animals were prevented from decaying by rising water or settling mud. The remains may have settled in forests, swamps, or the sea floor. They may have been crushed under the weight of thousands of feet of rock or squeezed in the buckling layers of the Earth's crust. They may have rested under the ground 10 million years or longer. The history of a fossil fuel deposit determines the properties of the fuel and that in turn the way people use it. 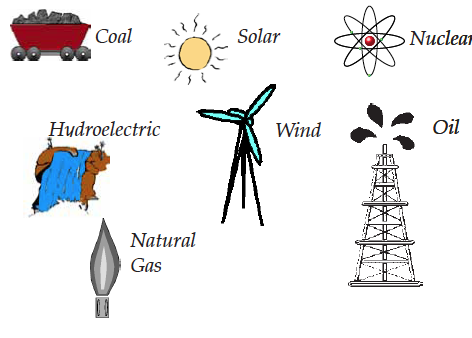 Of the energy sources shown here, which are fossil fuels? A chemical formula shows the number of atoms of each type in a molecule. For example, CH4 has one atom of carbon (C) and four atoms of hydrogen (H). Molecules composed of carbon and hydrogen atoms are called hydrocarbons. Oil and natural gas are mixtures of hydrocarbon chains of various lengths. In these molecules there are at least twice as many hydrogen atoms as carbon atoms. Each carbon atom can bond, or stick to as many as four other atoms. Here are some simple hydrocarbon molecules with their chemical formulae. Hydrocarbon molecules are not flat and straight like chemical diagrams. Can you tell which atoms are carbon and which are hydrogen in the pictures below? For the longer hydrocarbon chains the number of carbon atoms is used to name the molecule. For example, in Greek, okto= 8, pente=5, and deka=10. So, C8H18 is called octane; while C15H32 is called pentadecane. Nature does not neatly sort hydrocarbons for us. They are pumped from the ground in a mixture called crude oil. A refinery separates the crude oil into mixtures of hydrocarbons that are about the same length. In some cases long hydrocarbon chains are split into shorter ones. Most of the refined products are used for fuel. About half is gasoline. Other refinery products are lubricating oil, waxes, and raw materials for plastics and medicines. 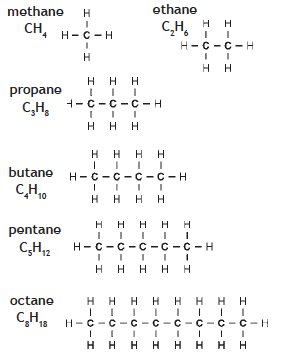 What are the names of the molecules shown here? What would you call this molecule? What properties would this substance have? The shortest hydrocarbon molecules (methane, ethane, propane, and butane) are gases—unless they are cooled or pressurized. They are the components of natural gas. Natural gas is often found in pockets above the deposits of crude oil. In early oil drilling, natural gas was not considered to be useful, so it was simply burned as waste. Eventually, people learned that natural gas is one of the cleanest-burning fuels, with very few air pollutants, making it desirable for heating and cooking. Now natural gas is captured and distributed through underground pipes in many regions of the country. The percentage of households using natural gas has increased dramatically over the past few decades, and natural gas has now replaced coal as the second most-used fuel in our society (after gasoline). Living material always has molecules rich in carbon and hydrogen, but fossil fuels are not always hydrocarbons. In ancient swamps and flooded forests, plant material rested under water where there was little oxygen. Anaerobic bacteria, which did not need oxygen, fed off these dead plants, converting some of the plant material into swamp gas—mainly methane. The methane rising from the swamp carried away hydrogen, leaving behind mostly carbon, which eventually formed coal, a rock that burns. Different classes of coal relate to age, hardness, and purity. Lignite and Subbituminous coal are the youngest and least pure. Bituminous coal is the most plentiful, most widely used, and produces a lot of pollutants when burned. Anthracite is the hardest, purest, and least abundant type. It makes almost no smoke when it burns. Coal was a key fuel used during the industrial revolution, powering steam engines and metal smelting furnaces in industry as well as steam locomotives for railroads. One drawback of coal is the high level of impurities, which results in pollution when the coal is burned. The other is that, as a solid, coal cannot be transported easily or through pipelines. One possible solution to both of these problems is to refine the coal and turn it into a synthetic hydrocarbon gas fuel. This would add extra cost to the fuel and reduce its energy value, but the process of coal gasification is still being explored because of the possible environmental benefits. We all make mistakes. Some mistakes have more serious consequences than others. The accidental grounding of the Exxon Valdez off the coast of Alaska in March 1989 spilled more than 10 million gallons of crude oil into the water and onto the beaches. The public was shocked. But what most people did not know is that oil spills are very common. More than 2,600 oil tankers sail the world’s oceans. During the year that followed the accident in Alaska, accidental oil spills of more than 10 thousand gallons occurred more than twice a week! The causes of oil spills are many. The Exxon Valdez ran aground by human error. Later that year an explosion set loose nearly 4,000,000 gallons of oil in the Gulf of Mexico. Lightning caused a spill of 3,000,000 gallons in Siberia. A collision between tankers dumped 3,000,000 gallons into the Mediterranean Sea. Bombing by guerrilla fighters dumped more than a million gallons of oil into Colombia’s waterways. It was a typical year. Pollution and oil spills are two hidden costs of our fossil-fuel-based system of energy production that are often ignored. If the health and environmental costs were included in our fuel prices, gasoline would cost much more. Drilling and mining are messy operations that can pollute and scar the landscape. Strip mining involves removing the surface rock from many acres of land. This technique is a relatively safe and simple way to recover shallow coal deposits, and provides about half the coal for the United States. At present, as required by law, coal mining operators attempt to restore the landscape. The resulting land may be suitable for farming or development. Whether land reclamation can restore a wilderness area is still debated. Question 3.4. What hidden costs of fuel need to be determined to compute the actual cost of a gallon of gasoline? I’m sorry, my son, but you’re too late in asking. Mr --------’s coal train has hauled it away. The story goes that Mr. -------- was angry when he heard this song. He did not think it was fair that the workers, managers, and owners of the coal company be held responsible for the impact of strip mining. His name is not printed here. The argument over what is fair is not settled. Who can fairly make the decisions about how coal is mined and where coal is mined? Who should pay the cost of land reclamation? Carbon combined with hydrogen (hydrocarbons) contains more energy than plain carbon, the main ingredient in coal. Oil has more energy per unit volume than coal. Hydrocarbon combustion produces CO2, water, and heat. In a complete combustion, all carbon and hydrocarbon products are burned, producing just water and carbon dioxide, neither of which are toxic. However, levels of carbon dioxide in the atmosphere are rising because of the combustion of fossil fuels. Carbon dioxide is one of several gases in the atmosphere called greenhouse gases. These gases hold heat in the atmosphere. Increased levels of carbon dioxide from the burning of fossil fuels could increase the average global temperature in the coming decades, resulting in unpredictable climate changes. Unfortunately combustion is rarely perfect, and unburned hydrocarbons, soot, and carbon monoxide (CO) are produced. Nitrogen from the air enters the combustion reaction forming nitrous oxide (NO2). Nitrous oxide and carbon monoxide are toxic gases, key ingredients of smog. Also, impurities in fuel result in other forms of air pollution, such as sulfur dioxide (SO2). Sulfur dioxide and nitrous oxide combine with moisture in the air to cause acid rain. Various technologies can reduce the amount of pollution. New cars have devices called catalytic converters to remove pollutants. Factories and power plants that burn coal can install a smokestack “scrubber,” in which sulfur dioxide bonds to quicklime removing 50% to 90% of the sulphur dioxide before the waste gas is released into the air. Which one moves in a repeating cycle, matter or energy? This diagram shows the path of matter and energy in the system of fossil fuels. Time scales in different parts of the picture vary dramatically. Between the green plant and the fuel pump, where energy-rich molecules are transformed to the fuels we use, part of the process happens naturally and part of it is done by the work of people. 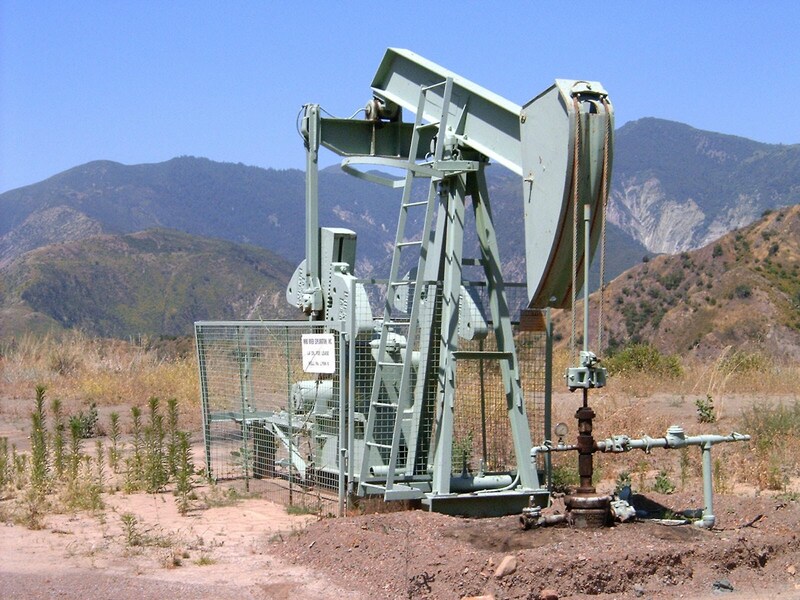 The natural part takes tens of millions of years to produce crude petroleum. Changing crude petroleum into fuel takes only hours in a refinery. The transformation of fuel into heat in a car takes seconds! If we continue to burn fuels at a rate of about 300 quads a year, we will have fuel for at least 100 years. The table of Estimated Fossil Fuel Reserves shows the reserves for each fossil fuel. It assumes the rate of fuel consumption will not grow and no new reserves will be discovered. We usually think about the cost of fossil fuels in terms of how much it costs to buy a gallon of gasoline. But there are other costs as well. Mining, drilling, and transporting fossil fuels frequently disrupts habitats for plants and animals as well as for people. Wars have been fought over energy-rich territory, such as the oil fields that lie near the borders of Iraq and Kuwait, or Equador and Peru. Also, many people suffer from the effects of air pollution, and the long term use of fossil fuels is causing global warming. In your opinion are these assumptions valid—the rate of fuel consumption will not grow and no new reserves will be discovered? What might happen in society when fossil fuel reserves run critically low? When and how should people plan for the transition from the Fossil Fuel Age to an age of other energy resources? We’ve found out what fossil fuels are, where they come from, how much fossil fuel is burned by people every year, and what effects that burning has on the environment. We’ve also looked into the future to see how long we have before we must find alternative sources of energy. 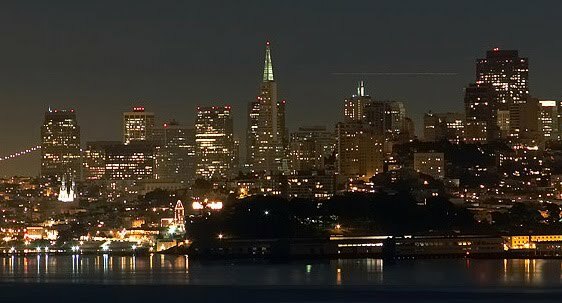 Most of the energy we use in homes, schools, and offices is in the form of electricity. Think, for a moment, about the ways you use electricity. You come home from school. Click, you flip on the light. You get a bottle of juice from the refrigerator. The refrigerator starts humming since the rush of warm room air triggers the cooling circuits. Beeps sound as you punch buttons on the microwave oven to pop popcorn. Click, you turn on the TV. If it’s cold, the furnace comes on to warm the house. Electric appliances make a big difference in your life. Electricity typifies one of the main ideals of an energy-using society—convenience. We do not need to trouble ourselves with fuels or matches when the flip of a switch turns on our lights. Turn a knob and in minutes our food is hot. No collecting wood or shoveling coal for us! When we hear the words “industrial society” we often think of factories and heavy machinery, not something clean and neat like the electricity we use in our homes every day. Yet electricity is a product of industry. The industry that generates and distributes electricity continues to grow. Where does the electricity in your home come from? When you plug in a toaster, you know it’s somehow connected to an electric meter at your home or apartment building, and then to electrical transmission lines outside. But where do the lines go? How is the electricity generated in the first place? In the next chapter, we will follow the lines all the way to the power plant and find out how electricity is generated to light and heat homes and businesses, and to run all the appliances we plug into our wall sockets. You may be surprised at the source of most of our electricity.